Emily Armstrong Toilets have been installed at the BMW Guggenheim Lab on First Street. “Rat City” is gone, and now the lot at First Street and First Avenue looks ready to host humans. 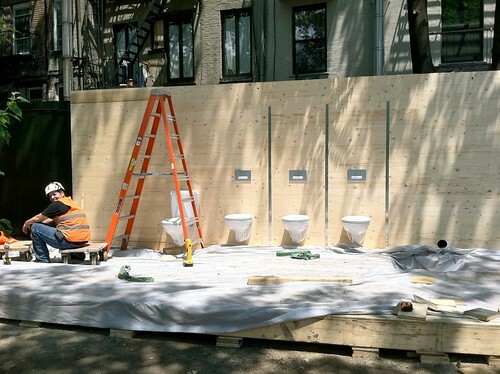 An eagle-eyed local passed along photos of new toilets being installed last Thursday at the BMW Guggenheim Lab, which will open on August 3. “I thought this was a sophomoric art installation, but it’s the real thing,” said Emily Armstrong, who snapped the photos. In an effort to head off any concerns about unwanted odors, a spokeswoman for the elaborate development at First Avenue and First Street said the toilets would be carefully maintained. Trevor Stahelski, the owner of a building on First Street that is near the high-tech outhouse facing Houston Street, said that the bathrooms were a small price to pay, given what used to be there. Stephen Rex Brown The shed housing the toilets. 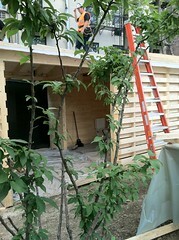 Indeed, the BMW Guggenheim Lab will be relatively short-lived; it closes Oct. 16. Though one prominent local expressed skepticism about the East Village serving as the headquarters of an “urban experiment,” no one has, of yet, lamented the eviction of the hoards of rodents that for years called the space home.